Limited running again today as the teams struggle with the cold weather. The morning was wet and slippy with a lot of grids and aero paint on show as short aerodynamic runs were the focus. The weather at least stayed dry throughout and heated up in the afternoon to give the teams a chance to showcase a bit more speed and longer runs. The second half of the day allowed the big boys to stretch their muscles. 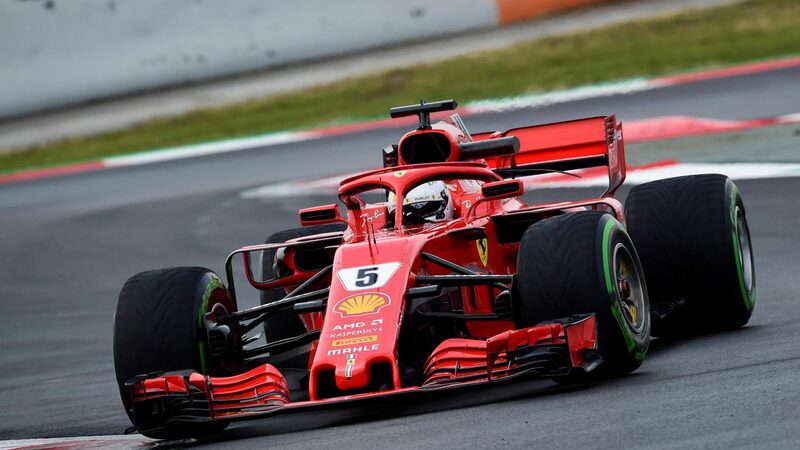 Vettel’s Ferrari finished the day top of the charts with a 1m19.673 beating Ricciardo’s table topping time from day one, albeit on the soft’s to Ricciardo’s mediums. Bottas took control of the W09 for the whole day, as Mercedes decided they didn’t want to lose time with a driver change, and finished 2nd on the timesheet also beating Ricciardo’s day one marker but this time on the same compound. Hamilton has never been a fan of testing so I presume he was pretty happy to give it up his afternoon slot. However, worse weather is predicted for tomorrow so I’m not sure which lucky driver will be in the garage. Verstappen was driving the Red Bull today and only completed 3 laps in the morning session due to a fuel leak. He was able to carry on as normal in afternoon racking up 67 laps. It might be very presumptive of me to guess the grid order already but it’s looks as though Mercedes, Ferrari and Red Bull are out in front with McLaren and Renault battling for 4th. Stoffel finished 3rd in the rankings but he was running the all new hypersoft tyres which are at least 2 grades thinner than everyone else. McLaren completed only 37 laps all day as they were in the garage for most of the afternoon which was originally broadcast as a set up change however it looks like they were investigating a small exhaust clip break. Caros Sainz managed to record another 67 laps in the Renault but was 1.5 seconds of the pacesetter. The Honda engine continues to run unhindered with no issues to report and 173 laps on the board for Toro Rosso over the first 2 days. Pierre Gasly also managed to finish the day 6th in the timesheets. Can Toro Rosso be the surprise package and challenge Renault and McLaren? Brendon Hartley has been very positive about the new engine and he believes McLaren have made a mistake. Kubica made his return to Formula 1 as a test driver in today’s afternoon session and surpassed Stroll and Sirotkin to become the fastest Williams driver so far. Maybe Williams have also made a mistake but it’s a bit too early to start discounting the youngest driver line up on the grid. One of the other youngsters on the grid, F1 newbie Charles LeClerc, recovered from an early spin to rack up 81 laps in the Sauber and recorded a quicker time than his experienced teammate managed on day 1. Force India got some much needed mileage after a disappointing first day, Esteban Ocon completed 89 laps in his first outing in the Pink Panther but the team were languishing down in 9th on the timesheets. Finally, Kevin Magnussen in the Haas had a day to forget finishing the day on 36 laps and dead last for the day. We still can’t read too much into the lap times, not only do we not know the set ups or fuel loads of the cars, we have only had two days of severely disrupted testing. With a potential washout expected in Barcelona tomorrow will the powers that be decide to add on an extra day of testing to the schedule?